For the 2002 television adaptation, see Doctor Zhivago (miniseries). As of 2016[update], it is the eighth highest-grossing film of all time in the United States and Canada, adjusted for ticket-price inflation. In 1998, it was ranked by the American Film Institute 39th on their 100 Years... 100 Movies list, and by the British Film Institute the following year as the 27th greatest British film of all time. The film takes place mostly against a backdrop of the pre-World War I years, World War I itself, the Russian Revolution of 1917, and the Russian Civil War. A narrative framing device, set in the late 1940s or early 1950s, involves KGB Lieutenant General Yevgraf Andreyevich Zhivago (Alec Guinness) searching for the daughter of his half brother, Doctor Yuri Andreyevich Zhivago (Omar Sharif), and Larissa ("Lara") (Julie Christie). Yevgraf believes a young woman, Tanya Komarova (Rita Tushingham), may be his niece and tells her the story of her father's life. After the burial of his mother in rural Russia, the orphaned Yuri Zhivago is taken in by his mother's friends in Moscow: Alexander (Ralph Richardson) and Anna Gromeko (Siobhán McKenna), and their daughter Tonya (Geraldine Chaplin). Tsarist Cossacks attack a peaceful demonstration. In 1913, Zhivago, as a medical student in training, but a poet at heart, meets Tonya as she returns to Moscow after a long trip to Paris. Lara, only 17, is involved in an affair with the older and well-connected Victor Ippolitovich Komarovsky (Rod Steiger), a friend of her mother's (Adrienne Corri). One night, the idealistic reformer Pavel Pavlovich ("Pasha") Antipov (Tom Courtenay) drifts into left-wing extremism after being wounded by sabre-wielding dragoons during a peaceful demonstration. Pasha runs to Lara, whom he wants to marry, to treat his wound. He asks her to hide a gun he picked up at the demonstration. Lara's mother discovers her affair with Komarovsky and attempts suicide. Komarovsky summons help from his physician (Geoffrey Keen), Zhivago's former professor, whom he accompanies back to Lara's home to treat her mother. When Komarovsky learns of Lara's intentions to marry Pasha, he tries to dissuade Lara, and then rapes her. In revenge, the humiliated Lara takes the pistol she has been hiding for Pasha and shoots Komarovsky at a Christmas Eve party, wounding him. Komarovsky insists no action be taken against Lara, who is escorted out by Pasha. Zhivago tends Komarovsky's wound. Although enraged and devastated by Lara's affair with Komarovsky, Pasha marries Lara, and they have a daughter named Katya. During World War I, Yevgraf Zhivago is sent by the Bolsheviks to subvert the Imperial Russian Army. Pasha is reported missing in action following a daring charge attack on German forces. Lara enlists as a nurse to search for him. Yuri Zhivago is drafted and becomes a battlefield doctor. During the February Revolution in 1917, Zhivago enlists Lara's help to tend to the wounded. Together they run a field hospital for six months, during which time radical changes ensue throughout Russia as Vladimir Lenin arrives in Moscow. Before their departure, Yuri and Lara fall in love, but Yuri remains true to Tonya, who became his wife. After the war, Yuri returns to his wife Tonya, son Sasha, and Alexander (Anna has since died), whose house in Moscow has been divided into tenements by the new Soviet government. Yevgraf, now a member of the Cheka, informs him his poems have been condemned by Soviet censors as antagonistic to Communism. Yevgraf arranges for passes and documents in order for Yuri and his family to escape from the new political capital of Moscow to the far-away Gromeko estate at Varykino, in the Ural Mountains. Zhivago, Tonya, Sasha, and Alexander board a heavily guarded cattle train, at which time they are informed that they will be travelling through contested territory, which is being secured by the infamous Bolshevik commander named Strelnikov, who is, in fact, Pasha Antipov. While the train is stopped early one morning, Zhivago wanders away. He stumbles across the armoured train of Strelnikov sitting on a hidden siding. Yuri is summoned before Strelnikov, whom he recognizes as the former Pasha Antipov. During a tense interview, Strelnikov informs Yuri that his estranged wife Lara is now living in the town of Yuriatin, then occupied by the anti-Communist White Army forces. He permits Zhivago to return to his family, although it is hinted by Strelnikov's right-hand man that most people interrogated by Strelnikov end up being shot. The family lives a peaceful life in a cottage at the Varykino estate until Zhivago finds Lara in nearby Yuriatin, at which point they surrender to their long-repressed feelings. When Tonya becomes pregnant, Yuri breaks off with Lara, only to be abducted and conscripted into service by Communist partisans. After two years, Zhivago at last deserts and trudges through the deep snow to Yuriatin where he finds Lara. Lara tells Yuri that Tonya had discovered her while searching for him, and that his family is now in Moscow. She reveals a sealed letter Tonya had mailed to Lara 6 months ago to give to Yuri: Tonya, her father, and their children are being deported and will live in Paris. Yuri and Lara renew their relationship. One night, Komarovsky arrives and informs them they are being watched by the Cheka due to Lara's connection by marriage to Strelnikov and Yuri's "counter-revolutionary" poetry and desertion. Komarovsky offers Yuri and Lara his help in leaving Russia. They refuse. Instead, they return to the abandoned Varykino estate, taking up residence in the banned main house, where Yuri begins writing the "Lara" poems. These will later make him famous but also incur government displeasure. Komarovsky reappears and tells Yuri that Strelnikov was captured only five miles away while apparently returning to Lara, but then committed suicide en route to his own execution. Therefore, Lara is in immediate danger of execution herself, as the Cheka had only left her free to lure Strelnikov out of hiding. Zhivago sends Lara and Katya away with Komarovsky, who has been appointed a government official in the nominally independent Far Eastern Republic of the early 1920s. Refusing to accompany a man he despises, Yuri remains behind to face his fate. Years later, Yevgraf finds a sick and destitute Yuri in Moscow during the Stalinist era and gives him a new suit and a job. While riding a tram, Yuri spots a woman he surely thinks is Lara walking on a nearby street. Unable to call her from the tram, Yuri struggles to get off at the next stop. Yuri runs after her but suffers a fatal heart attack before he can even signal to her, and the woman walks away oblivious to Yuri's presence. Yuri's funeral is well attended, a surprise to Yevgraf as Yuri's poetry was officially "unobtainable at the time". Lara approaches Yevgraf at the funeral and reveals she had given birth to Yuri's daughter, but lost her in the collapse of the White-controlled government in Mongolia. After vainly looking over hundreds of orphans with Yevgraf's help, Lara disappears during Joseph Stalin's Great Purge of the late 1930s, and "died or vanished somewhere ... in one of the labour camps", according to Yevgraf. While Yevgraf strongly feels that Tanya Komarova is Yuri and Lara's daughter, he is still not convinced. But as Tanya leaves, Yevgraf notices that she carries a balalaika, an instrument that Yuri's mother was especially gifted at playing. Questioning her further, he learns that Tanya is self-taught — in fact, her fiancé proclaims her an 'artist' with the balalaika. Yevgraf smiles, "Ah. Then it's a gift", thereby implying she truly must be Yuri and Lara's daughter after all. Rita Tushingham as Tanya Komarova / "The Girl"
Bernard Kay as Kuril / "The Bolshevik"
Geoffrey Keen as Prof. Boris Kurt / "Medical Professor"
Boris Pasternak's novel was published in the West amidst celebration and controversy. Parts of Pasternak's book had been known in Samizdat since some time after World War II. However, the novel was not completed until 1956. The book had to be smuggled out of the Soviet Union by an Italian called D'Angelo to be delivered to Giangiacomo Feltrinelli, a left-wing Italian publisher who published it shortly thereafter. Helped by a Soviet campaign against the novel, it became a sensation throughout the non-communist world. It spent 26 weeks atop The New York Times best-seller list. Pasternak was awarded the 1958 Nobel Prize for Literature. While the citation noted his poetry, it was understood[by whom?] that the prize was mainly for Doctor Zhivago, which the Soviet government saw as an anti-Soviet work, thus interpreting the award of the Nobel Prize as a gesture hostile to the Soviet Union. A target of the Soviet government's fervent campaign to label him a traitor, Pasternak felt compelled to refuse the Prize. The situation became an international cause célèbre and made Pasternak a Cold War symbol of resistance to Soviet communism. The film treatment by David Lean was proposed for various reasons. Pasternak's novel had been an international success, and producer Carlo Ponti was interested in adapting it as a vehicle for his wife, Sophia Loren. Lean, coming off the huge success of Lawrence of Arabia (1962), wanted to make a more intimate, romantic film to balance the action- and adventure-oriented tone of his previous film. One of the first actors signed onboard was Omar Sharif, who had played Lawrence's right-hand man Sherif Ali in Lawrence of Arabia. Sharif loved the novel, and when he heard Lean was making a film adaptation, he requested to be cast in the role of Pasha (which ultimately went to Tom Courtenay). Sharif was quite surprised when Lean suggested that he play Zhivago himself. Peter O'Toole, star of Lawrence of Arabia, was Lean's original choice for Zhivago, but turned the part down; Max von Sydow and Paul Newman were also considered. Michael Caine tells in his autobiography that he also read for Zhivago and participated in the screen shots with Christie, but (after watching the results with David Lean) was the one who suggested Omar Sharif. Rod Steiger was cast as Komarovsky after Marlon Brando and James Mason turned the part down. Audrey Hepburn was considered for Tonya, while Robert Bolt lobbied for Albert Finney to play Pasha. Lean was able to convince Ponti that Loren was not right for the role of Lara, saying she was "too tall" (and confiding in screenwriter Robert Bolt that he could not accept Loren as a virgin for the early parts of the film), and Yvette Mimieux, Sarah Miles and Jane Fonda were considered for the role. Ultimately, Julie Christie was cast based on her appearance in Billy Liar (1963), and the recommendation of John Ford, who directed her in Young Cassidy (1965). Sharif's son Tarek was cast as the young Zhivago in the film and Sharif directed his son as a way to get closer to his character. 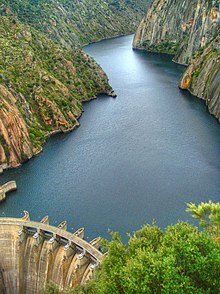 The initial and final scenes were shot at the Aldeadávila Dam between Spain and Portugal. Because the book was banned in the Soviet Union, it could not be filmed there. Lean's experience filming a part of Lawrence of Arabia in Spain, access to CEA studios, and the guarantee of snow in some parts of Spain led to his choosing the country as the primary location for filming. However, the weather predictions failed and David Lean's team experienced Spain's warmest winter in 50 years. As a result, some scenes were filmed in interiors with artificial snow made with dust from a nearby marble quarry. The team filmed some locations with heavy snow, such as the snowy landscape in Strelnikov's train sequence, somewhere in Campo de Gómara near Soria. The film was shot over ten months, with the entire Moscow set being built from scratch outside Madrid. Most of the scenes covering Zhivago's and Lara's service in World War I were filmed in Soria, as was the Varykino estate. The "ice-palace" at Varykino was filmed in Soria as well, a house filled with frozen beeswax. The charge of the partisans across the frozen lake was also filmed in Spain; a cast iron sheet was placed over a dried river-bed, and fake snow (mostly marble dust) was added on top. Some of the winter scenes were filmed in summer with warm temperatures, sometimes of up to 25 °C (77 °F). Other locations include the Estación de Madrid-Delicias in Madrid and El Moncayo. The initial and final scenes were shot at the Aldeadávila Dam between Spain and Portugal. Although uncredited, most of those scenes were actually shot on the Portuguese side of the river, overlooking the Spanish side. Other winter sequences, mostly landscape scenes and Yuri's escape from the partisans, were filmed in Finland. Winter scenes of the family traveling to Yuriatin by rail were filmed in Canada. The locomotives seen in the film are Spanish locomotives like the RENFE Class 240 (ex-1400 MZA), and Strelnikov's armoured train is towed by the RENFE Class 141F Mikado locomotive. One train scene became notorious for the supposed fate that befell Lili Muráti, a Hungarian actress, who slipped clambering onto a moving train. Although she fell under the wagon, she escaped serious injury and returned to work within three weeks (and did not perish or lose a limb). Lean appears to have used part of her accident in the film's final cut. Nicolas Roeg was the original Director of Photography and worked on some scenes, but after an argument with Lean, left and was replaced by Freddie Young. Released theatrically on 22 December 1965, the film went on to gross $111.7 million in the United States and Canada across all of its releases and is the eighth highest-grossing film of all time adjusted for inflation. In addition, it is also the eighth highest-grossing film worldwide after adjusting for inflation. The film was also entered into the 1966 Cannes Film Festival. In 2002, the 35th Anniversary version of Doctor Zhivago was issued on DVD (two-disc set), and another Anniversary Edition in 2010 on Blu-ray (a three-disc set that includes a book). 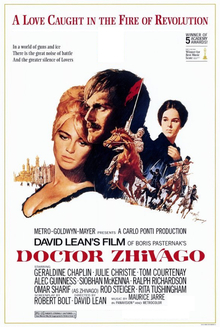 Upon its initial release, Doctor Zhivago was criticized for its romanticization of the revolution. Bosley Crowther of The New York Times felt that the film's focus on the love story between Zhivago and Lara trivialized the events of the Russian Revolution and the resulting civil war, but was impressed by the film's visuals. Also critical of the film was The Guardian's Richard Roud, who wrote: "In the film the revolution is reduced to a series of rather annoying occurrences; getting firewood, finding a seat on a train, and a lot of nasty proles being tiresome. Whatever one thinks of the Russian Revolution it was certainly more than a series of consumer problems. At least it was to Zhivago himself. The whole point of the book was that even though Zhivago disapproved of the course the revolution took, he had approved of it in principle. Had he not, there would have been no tragedy". Brendan Gill of The New Yorker called the film "a grevious disappointment ... these able actors have been given almost nothing to do except wear costumes and engage in banal small talk. 'Doctor Zhivago' is one of the stillest motion pictures of all time, and an occasional bumpy train ride or crudely inserted cavalry charge only points up its essential immobility." The Monthly Film Bulletin wrote: "The best one can say of Doctor Zhivago is that it is an honest failure. Boris Pasternak's sprawling, complex, elusive novel is held together by its unity of style, by the driving force of its narrative, by the passionate voice of a poet who weaves a mass of diverse characters into a single tapestry. And this is precisely what David Lean's film lacks. Somewhere in the two years of the film's making the spirit of the novel has been lost." Among the positive reviews, Time magazine called the film "Literate, old-fashioned, soul-filling and thoroughly romantic". Variety declared, "The sweep and scope of the Russian revolution, as reflected in the personalities of those who either adapted or were crushed, has been captured by David Lean in 'Doctor Zhivago,' frequently with soaring dramatic intensity. Director has accomplished one of the most meticulously designed and executed films—superior in several visual respects to his 'Lawrence of Arabia.'" Philip K. Scheuer of the Los Angeles Times called the film "as throat-catchingly magnificent as the screen could be, the apotheosis of the cinema as art. With Spain and Finland doubling, absolutely incredibly, for Moscow and the Urals in all seasons, we are transplanted to another land and time ... if you will brace yourself for an inordinately lengthy session—intermission notwithstanding—in a theater seat, I can promise you some fine film-making." Richard L. Coe of The Washington Post called it "Visually beautiful and finely acted." He identified the film's length as its "greatest drawback" but wrote that "we weary of the long train ride or become impatient with individual scenes, but, thinking back on them, we perceive their proper intent." Clifford Terry of the Chicago Tribune wrote that director David Lean and screenwriter Robert Bolt "have fashioned out of a rambling book, a well controlled film highlighted by excellent acting and brilliant production." Reviewing it for its 30th anniversary, film critic Roger Ebert regarded it as "an example of superb old-style craftsmanship at the service of a soppy romantic vision", and wrote that "the story, especially as it has been simplified by Lean and his screenwriter, Robert Bolt, seems political in the same sense Gone With the Wind is political, as spectacle and backdrop, without ideology", concluding that the political content is treated mostly as a "sideshow". Geoffrey Macnab of The Independent reviewed the film for its 50th anniversary and noted director David Lean's "extraordinary artistry" but found the film bordering on "kitsch". Macnab also felt that the musical score by Maurice Jarre still stood up but criticised the English accents. The film presently holds a score of 82% on Rotten Tomatoes based on 45 reviews, with an average grade of 7.5 out of 10. The critical consensus reads: "It may not be the best of David Lean's epics, but Dr. Zhivago is still brilliantly photographed and sweepingly romantic." Both Doctor Zhivago and The Sound of Music received the most nominations at the 38th Academy Awards, where they were each nominated in ten categories. Both films won five oscars apiece, but The Sound of Music beat out Doctor Zhivago in the Best Picture and Director categories. Julie Christie—not nominated for her role in Doctor Zhivago—won the Best Actress Oscar for her performance in Darling. The film was nominated for six Golden Globe Awards, and won five. ^ "DOCTOR ZHIVAGO (A)". British Board of Film Classification. 25 February 1966. Retrieved 10 July 2015. ^ a b "Doctor Zhivago (1965)". Box Office Mojo. Retrieved 29 April 2014. ^ Caine, Michael (1994). What's It All About? (1st U.S. Ballantine Books ed. Feb., 1994. ed.). New York: Ballantine Books. ISBN 978-0345386809. ^ Murray, Rebecca (2010). "Michael Caine Discusses 'Journey 2: The Mysterious Island'". About.com: Hollywood Movies. Oahu, HI. Archived from the original on 8 April 2014. Retrieved 4 March 2014. I did all the back heads for the screen tests for Dr. Zhivago. Julie Christie, who's a friend of mine, went up to play the part and she said, 'You come and play the other part with me,' so I went. ^ "Doctor Zhivago (1965) - Articles - TCM.com". Turner Classic Movies. Retrieved 10 March 2016. ^ a b "Filming in Madrid". ^ "Línea Santander-Mediterráneo. Campo de Gómara". ^ Geraldine Chaplin appearance on the What's My Line?, episode 814. Originally aired 2 January 1966 on CBS. Viewed on 10 September 2007. ^ "Dr. Zhivago stunt death". www.snopes.com. Retrieved 9 January 2016. ^ "Woman Falling Under a Train in Doctor Zhivago". www.thingsinmovies.com. 1 November 2011. Retrieved 9 January 2016. ^ "Nicolas Roeg". the Guardian. Retrieved 10 March 2016. ^ "Doctor Zhivago". Festival de Cannes. 1966. Retrieved 7 March 2009. ^ "DVD & Blu-ray cover art release calendar- May 2010". dvdtown.com. Archived from the original on 15 February 2010. Retrieved 17 May 2010. ^ a b Ebert, Roger (17 April 1995). "Doctor Zhivago". RogerEbert.com. Retrieved 29 August 2016. ^ Crowther, Bosley (23 December 1965). "Movie Review, Doctor Zhivago (1965)". The New York Times. ... has reduced the vast upheaval of the Russian Revolution to the banalities of a doomed romance. ^ Roud, Richard (29 April 1966). "Doctor Zhivago review – archive". The Guardian. Retrieved 29 August 2016. ^ Gill, Brendan (1 January 1966). "The Current Cinema". [[[The New Yorker]]: 46. ^ "Doctor Zhivago". The Monthly Film Bulletin. 33 (389): 86. June 1966. ^ "Cinema: To Russia with Love". Time Magazine. 31 December 1965. Retrieved 29 August 2016. ^ "Doctor Zhivago". Variety: 6. 29 December 1965. ^ Scheuer, Philip K. (December 24, 1965). "'Zhivago'---a Poetic Picture". Los Angeles Times. Part II, p. 11. ^ Coe, Richard L. (4 February 1966). "Doctor Zhivago". The Washington Post: C4. ^ Terry, Clifford (January 28, 1966). "Acting Excellent, So Is Production in 'Doctor Zhivago'". Chicago Tribune. Section 2, p. 13. ^ Macnab, Geoffrey (26 November 2016). "Doctor Zhivago, film review: David Lean's epic romance celebrates 50th anniversary". Retrieved 30 August 2016. ^ "Doctor Zhivago". Rotten Tomatoes. Retrieved 18 November 2018. ^ a b "The 38th Academy Awards (1966) Nominees and Winners". oscars.org. Retrieved 24 August 2011. ^ "The New York Times: Doctor Zhivago". The New York Times. Retrieved 26 December 2008. Christie, Ian (2015). Doctor Zhivago. BFI Film Classics. Palgrave Macmillan. Wikimedia Commons has media related to Doctor Zhivago (film).